It all began in 2014, when I attended some one day courses given by Fergus Garrett, head gardener at Great Dixter and CEO of The Great Dixter Trust www.greatdixter.co.uk Never considering myself a gardener before, the days with Fergus were filled with inspiration and he was (and always is) very generous with his knowledge. Making copious notes as I always do on such days meant I had many excellent tips to get me started. And when I did get got going, I realised that not only did I know more than I gave myself credit for, but also I LOVED every single second of ‘gardening’. Really, for me, it is connecting with nature in a more organised way than I used to in our garden. In the past, I tended to let the garden do its own thing, cautious to intervene in case things didn’t grow again! What I learnt from Fergus gave me the confidence to dig things out, dig things in, replant, repot, split up, replan, seed, regenerate, and much more besides. Always with guidance from Mother Nature of course. Then in 2015, I came across a wonderful book The Flower Farmer’s Year by Georgie Newbery of Common Farm Flowers www.commonfarmflowers.com A pure delight to behold, I read this book from cover to cover in a few days. The Flower Farmer’s Year ignited something within me in the same way Ian White’s Bush Flower Healing book on Australian Bush Flower essences inspired my journey into the world of flower essences way back in 1995. The Flower Farmer’s Year felt like the missing link…I knew a farmer was living somewhere deep inside of me. And I have always loved flowers. Putting flower farming and flower essences together made – makes – perfect sense! I am a flower farmer. A journey of a thousand miles begins with a single step. So my vision for a flower farm with hundreds of acres of colourful flowers growing as live medicine fields began with sowing my first seeds in late March, and growing my first British flowers in 5 new large flower beds. Through Common Farm Flowers I found Higgledy Garden Seeds, a small seed supplier www.higgldygarden.com who gathers his seeds by hand from his own organically grown flowers. An order was placed in March for 16 different annuals, all chosen intuitively. Our old, tired glass greenhouse had been scrubbed up, new seed trays at the ready, so when the seeds arrived, off I went with my seed sowing. The journey of beginning the fledgling farm coincided with the last months of our beloved Basil’s life. 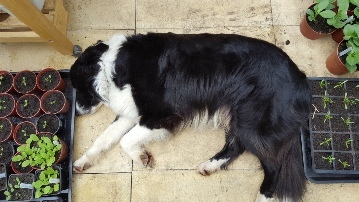 Basil – Grand Master Bas – was our oldest border collie. He came to us from the RSPCA at 12 weeks old. He died in August 2016, aged 16 years and 10 months. Basil has been present at every single essence I have ever created. Over 100+ essences have been graced with Basil’s wise, calm, gentle presence and guided by him. As the Spring turned into Summer, we knew we were accompanying Basil on his journey of leaving his Earthly life. We could see he was slowing up. Sowing the seeds with Basil in the greenhouse, planting the growing plantlets out in the new raised beds with Basil inspecting my planting plan and methodology, watching the first flowers bloom with Basil alongside me just made the whole journey more special, so very memorable and a genuine gift. I had to tend to the new jungle of plantlets growing in the greenhouse daily, intuitively learning the timing of when to plant out, when to water, when to feed. Every day was spent with Basil and the flowers, as well as all our other beautiful collies. Every day was peaceful. Every day was a delight. Every day was special. Every day was exciting, trotting up the garden with the pack to see what had bloomed for the first time that day. Working with all this new knowledge guided me to the ‘Aha’ moment of starting the flower farm right here in our own garden. In the past I would have waited until we actually had ‘a farm’ to start the venture. But with 2 acres of very beautiful land and natural gardens, full of mature fruit trees, oak, beech, sweet chestnut, maple, silver birch and willow to name but a few other trees and an abundance of perennials, shrubs, roses and clematis, honeysuckles, jasmine plus Spring snowdrops, crocus and daffodils, I knew the time was right to begin with new raised beds to explore growing annual flowers, right here, right now. 2 acres is a tiny space compared to what most would call a farm, but I felt the important thing was to just begin with what we had. My research on numerous websites showed me over and over that artisan flower growing in the UK is on the up, with more and more people interested in having access to beautiful garden flowers, grown locally, naturally and as organically as possible. These people want to know the provenance of the flowers they choose for their weddings, celebrations and the flowers they choose to have in their home. British garden flowers are a growing (!) market. Having spent the last 2 years developing new ranges of garden flower, blossom flower and meadow flower essences all from the flowers already growing in our garden, my passion is always about sharing the wisdom of nature in new and exciting ways, translating the healing library of free medicine which is held in Nature’s data banks - the trees, flowers, plants and all living elements of our Earth – for personal and global well-being. Giving people the chance to ‘meet the flowers in person’, to feel their essence for themselves, to see the sacred geometry of the Universe in a flower, makes me feel very excited. Whether this would be through a single hand tied posy or flowers for a special celebration, my ideas began to flow about new possibilities for sharing the wisdom of all the flowers here. Taking care of Basil and the new flower farm took up all day every day. With great joy. I can look back over the year and feel nothing but love for the way it unfolded. The flowers had their own timing to grow and bloom in. I followed their guide, worked to their schedule, listened quietly to the way they wanted it to be. And so it was with dear Basil. I know my energy well now. I have a million ideas a day. In the past, I wanted to do them all at once, and sometimes even tried to, wearing myself out in the process! Now I have learnt to write them down, and take the time to feel which ones are for now, or for the future, or for some other time and place. This year especially I learnt to follow nature – and Basil’s time. Both Basil and the flowers made sure I was ‘in the NOW’. 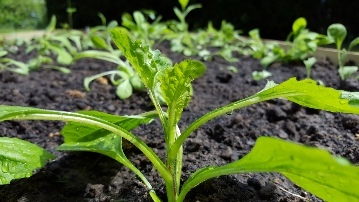 If you want to become present and learn how to master this every day – even if you think you have learnt how to be present - grow some flower seeds in a pot and watch, listen, learn from the flower’s time. There is no other time but NOW for flowers. And Basil. After the coldest and wettest June on record, and still spending time outside with the growing (chivering!) plantlets, taking refuge in the greenhouse will all 4 dogs in between rain showers, July took over as ‘flaming June’ and my green shoots bloomed in abundance as vibrant, colourful, strong flowers. Magnificent and majestic colour from early July onwards. 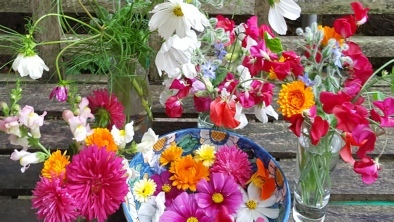 End of July I began making up hand tied posies and selling them at our gate, with the intention of covering the cost of the seeds. Making each posy was like creating a personalised flower essence blend. 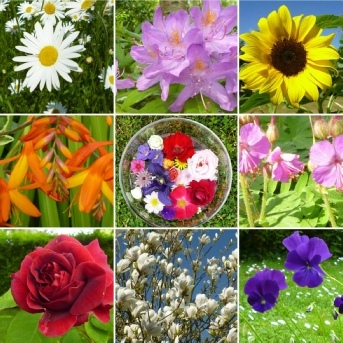 Each one was unique in terms of colour, shape, the flowers and scents used. I LOVED putting each posy together. 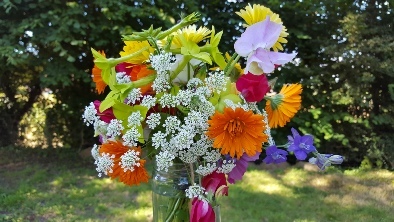 I began to get texts from neighbours and passers-by who were buying the flowers, saying how the posies made them smile. A neighbour told me she was taking the posies into our local hospice for a lady who was very ill and this lady always cheered up when she looked at her posy. Another neighbour who was having a very difficult time, told me how the flowers made her feel lighter. My journey of a thousand miles was already quite a few steps in by mid August. 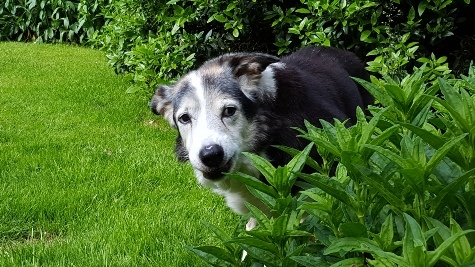 On 23rd August our beloved Basil died naturally and peacefully in our arms, with our three other collie dogs around him too. It was a very sacred moment in time. 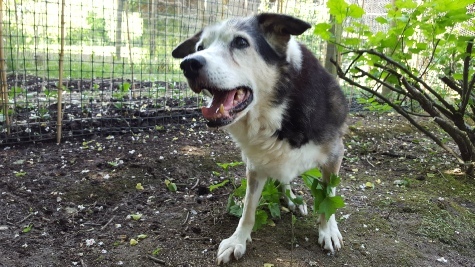 We had Basil cremated and with the pack, walked his ashes around the garden in all his favourite places, especially where he’d watch the moon rise and bark at the full moon. He will always live in our hearts and his own essence is part of all that inspires us. Cosmos, sweet peas, snap dragons, calendula, dahlias and many perennials continued to flower well into November, so Basil’s picture in our fireplace got fresh flowers regularly from the new Orchard Oast flower farm he helped me to seed, grow and bloom through his last year with us.